Is an Embryoscope Really Useful? In the recent times, one of the latest technological gimmicks that has got a great deal of attention is the embryoscope. Many IVF clinics are now touting the fact that their lab has this latest piece of equipment- they claim it helps improve success rates. 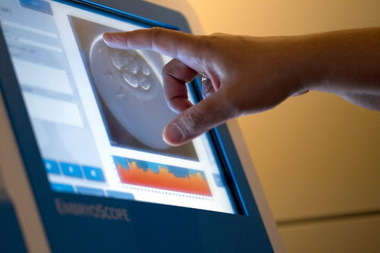 The embryoscope is essentially a videomicroscope that that allows the embryologist to take many images of each embryo over a period of time; the technique used is called time lapse videography. Using this, it’s possible to review how much development has taken place in the embryo, over the period of 3-5 days; that’s the time it spends in vitro, in the incubator. The one good thing about the embryoscope is that it provides excellent pictures and is an excellent tool to train embryologists. They are able to learn what the different stages of embryo development are, and how the embryo cleavage occurs in an IVF lab. From a logical viewpoint, this kind of a device makes a great deal of sense. It gives us very precise information about how each embryo is growing and the chance to choose the very best ones – that’s the one which divides faster and which may mean they are of a better quality. In clinical practice, the utility of the embryoscope is yet to be proven. In case there are multiple embryos, all of which that look equally good at a certain point of time; it’s possible to review the images that the embryossope has provided to get more information about how each one of the embryos developed- this helps the embryologist pick the one that is better. However most experienced embroyologists are able to select the best embryo based on various conventional morphological criteria such as the number of cells, their equality; and the presence of fragmentation. And so, the additional information that is provided by an embryoscope isn’t of much clinical utility in the case of most patients. It’s largely the poor responder patients who tend to create more problems for the IVF clinics as they have a very poor success rate. The utility of the embryscope is very limited in their case as there are very few embryos to choose from, in the first place. Contrastingly, when patients have a larger number of good quality embryos, the chances of success are far higher, regardless of whether an embryoscope is used. The point I’m trying to make here is that in certain settings, the embryosope can be a very good research tool; however, it remains to be proven whether it actually is of any help to IVF clinics in improving their success rates. In fact, this is the case with any type of technological advance. Since the companies that manufacture the embryoscope are very aggressive in the manner in which they go about it, a large number of IVF clinics buy this device; In turn, they advertise that they have the latest technology, and hope that it will attract more patients. However, using the embryoscope is extremely expensive - and is very unlikely to provide cost-effective use in clinical practice today.